Every little girl loves Minnie Mouse. This licensed bounce house will bring a Minnie Mouse fan's fantasy come true. 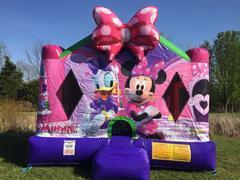 Minnie Mouse and Daisy are featured on this moon bounce.